The Global Association for Carnatic Music organized this session where the audience were face to face with a few leading musicians. Sudha’s session happened to be on the 29th December, 2007, at 4 pm and the venue was Hotel Sangeetha (RA Puram, Chennai). As she entered all enthusiastic, to meet the audience and her rasikas, she was pleasantly surprised to see the room brimming with curious and eager faces, all poised to spring the questions at her. Here is a gist of the questions raised – some of them were singular and focused on a particular topic. Some of them had offshoots in multiple aspects and some of them were candid and suggestive. To her mind, Sudha had been honest, explicit, introspective and open. She handled the questions in her own sincere fashion, never for a moment in restraint. The session began with the first question where there was an acknowledgement of her extensive travel across the world and her musical footprints. This was followed by the suggestion that she write a book on the wealth of experience, observations and learning. Then was a request for an elaboration of her role in charity and of her Foundation. The next participant wanted to know what her learning from her Guru was, other than the music that she taught. This brought a smile to Sudha’s face and she was caught reminiscing ‘those’ days fondly. It had been no doubt, an overwhelming phase of her life and the expressions of her experiences just flowed. In the same vein, the next question was on her role in the revival of Harikatha. Sudha elaborated on the current status of Harikatha and how some youngsters have, through their commitment, made it big and brought this sacred art form to the forefront. And yes, she would most certainly do her bit in fostering it further. To a question on how did she hit upon the idea of ‘healing through music’, Sudha shared some interesting experiences on how some of her songs proved to have a soothing and positive effect on persons suffering from some specific ailments. This was actually referred and confirmed by the Doctor who had been a part of the discussions Sudha was having on the particular subject. The comment on the importance of knowing the language of the song which is being sung, thereby giving an impetus to the diction and pronunciations, which quite naturally heightened the aesthetics in the music, made Sudha contemplate and bit and then smile. Yes, she affirmed and believed that being fluent in the language most definitely helped. She was lauded on her Kannada and Telugu renderings, which with it’s flawless diction, gave commendable weight to her delivery. There was a query on a very pertinent thought that must have been plaguing the minds of many rasikas – why is it that music teachers don’t become musicians and vice versa? And how do accompanists cope and align to different styles of vocalists without prior planning and rehearsals? Await Sudha’s responses which will be uploaded for listening, shortly. On the question of who were her favorite composers, the contemplating smile returned. And she specified why she chose to sing the kritis of the mentioned composers. Due to paucity of time, the Organizers announced that one last question can be accommodated, and what a question it was…very relevant, very thought provoking and it did kindle a lot of minds. 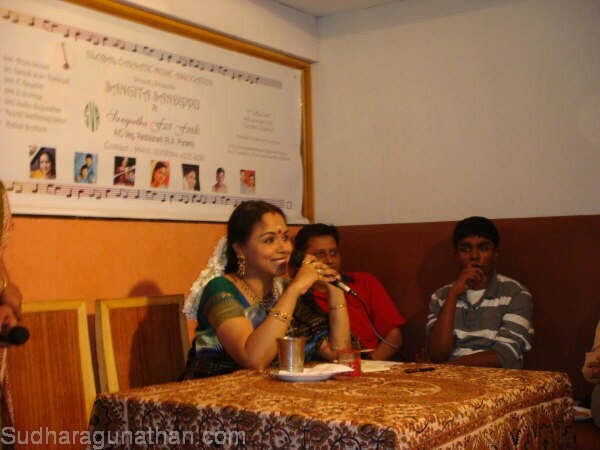 Music must be made a part of the curriculum in schools – what would Sudha’s contribution be to it?! Watch out for the chat session that will be made available for viewing shortly. Sudha ended the session thanking the audience who had taken time off on a precious Sunday to be with her while they had options to do many more things.